I love my deep, dark, velvet curtains. This was my Pottery Barn inspiration photo. Here’s a glimpse of my dining room last week. Remember how much I loved my drop cloth curtain in the laundry room? Well, here’s the lightening up version of my dining room. I used the paint drop cloths from Lowes. The first time I saw this idea was on Layla’s blog, theletteredcottage.net. She uses them in her dining room and they look perfect. I love the way they have a natural linen/burlapish feel. I’m so excited about the way they turned out. I’m not loving the tie backs. I’d rather not have tie backs at all, but I like the way the light comes in when the drapes are pulled back. I have a lot more springifying to do in the dining room, but right now I’m glad I’ve lightened up a bit. Looks amazing! I need to send someone a picture of my living/dining rooms and get some ideas…I'm terrible with that! Looks great! The new curtains make the room look so bright and airy. I think you made an excellent choice for the summer months. Oh I love it!! That made a huge difference!! Gotta love those drop cloths. I am afraid Lowes is going to catch on and raise the price!! I love your other drapes too, but this will be great for Spring and Summer!! Nice! I just got some linen panels from Target that I will be lightening up my dining room with, too. Love the treatment I have, but I'm feeling it's a little heavy for Spring/Summer and I think the linen will do the trick. 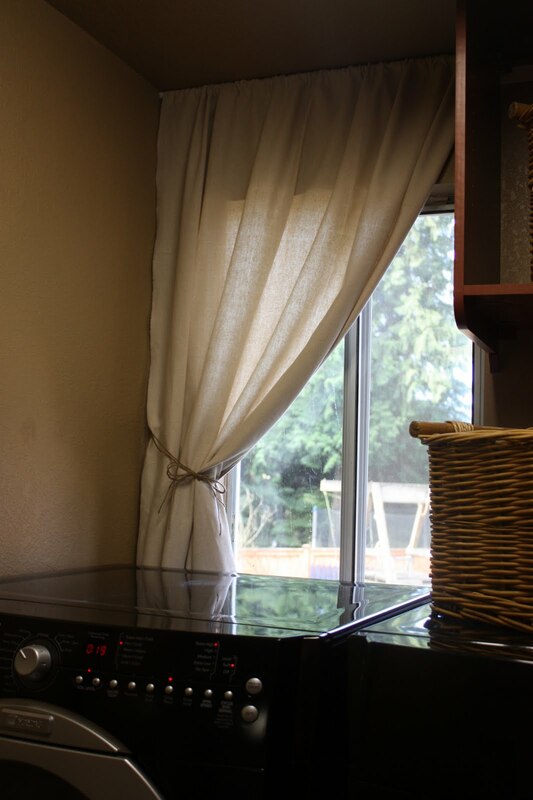 I did love the one in your laundry room ~ glad to see you were able to adapt it to your dining room! 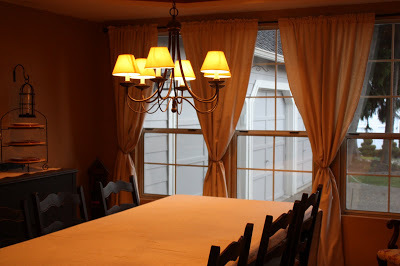 The curtains make a huge difference…it is very light and springy now. I've been thinking about taking down my dark curtains for the summer, but I'm not sure I can get my hubby to buy it 😉 Your room looks great! The light curtains are so perfect for spring! I want to come to dinner sometime. 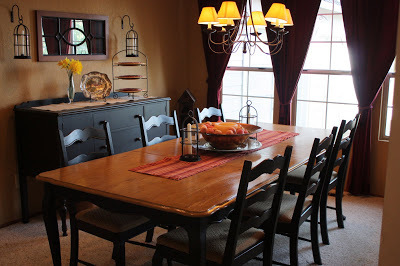 Your dining room looks so inviting! Saw you on Feature yourself Friday. What a big difference. Looks great! It's like night and day! I love it! I use drop cloth curtains throughout my whole house.. I'm addicted! The painter's drop cloth drapes look great. The room is brighter looking. Thanks for the compliments on my table. Glad I inspired you. That is what blogging is all about. Can't wait to see what you do. Wow! That made a huge difference. Beautiful for the season. Love what you did in there! I'm gonna have to get to Lowes!! My guest room could use that same makeover! Thanks for sharing!! They look great! I love that idea. Wow! They changed the entire room! Amazing. I do love your deep velvet drapes too though! Brilliant! Love the summer look and in the fall you can get the velvet out again. What fun. Love the new, lightened look! Beautiful! Oh I love it! What a difference that made:) I need to do something like this on our big ugly apartment sliding doors, I'll have to look into the drop cloth idea. I am so intrigued. I have like eight windows in my living room. 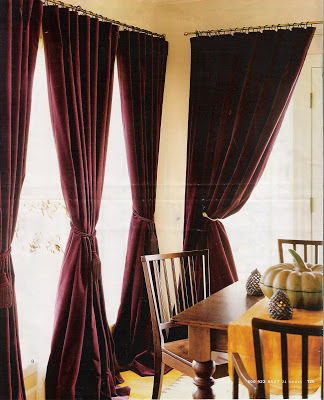 I spent way too on window treatments ten years ago and now I am soooooooo over them. This could be my solution. Thanks for sharing. Yours look amazing. I don't sew much but I am guessing you just made a rod pocket? I also would like to hang them a bit high and have them drag. I'm heading to Lowe's to see if this will work. So fresh and bright! Glad I stopped by! I DO love this lighter look for Spring! I love those dark chairs with the light curtains. Looks fab!! What a transformation for the spring great job! I love using drop cloth!! It is the best material! 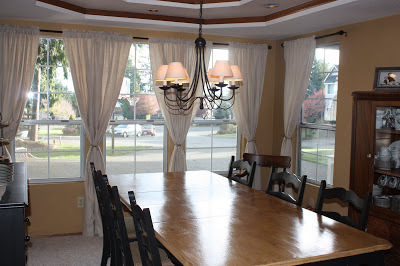 Your dining room is beautiful!! Wow the lighter color really lightens up the room! 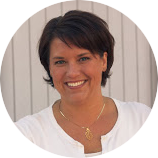 What a great transformation with something so simple. It looks so light and fresh. Great job. What a difference the light curtains make…and for so little too! What a transformation! The new curtains really ligtened up the room. Love the change!! 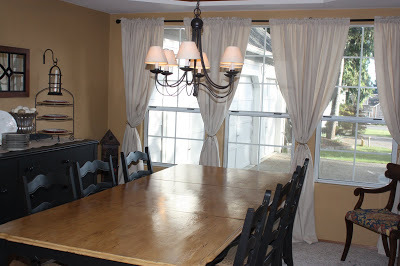 And I love your light fixture/chandelier over your table…am looking for one just like that for our dining room. Can I ask where you found yours? Thanks!